China’s passenger vehicle market is in the crosshairs of many U.S. companies with “green” automotive technology. The bus market is also getting a lot of attention. There hasn’t been much focus on efforts to make the medium and heavy-duty truck sector more environmentally friendly, however. The Summit, which last year was held in Beijing, is part of a program launched about a year and a half ago with the U.S. Department of Commerce. www.commerce.gov For the Department of Commerce, the primary goal is to help U.S. companies sell their technology in China, said Van Amberg. For Calstart, the broader goal is growing the use of greener technology globally. China is a hot market for that. “For fast-paced environmental improvements, China is a huge emerging space,” he said. And it is emerging even more quickly since China’s netizens have become super-critical of China’s air pollution problem. China’s central government tried to pretend the air wasn’t that bad. Posts by the air quality monitor at the U.S. Embassy in Beijing ended that façade. http://beijing.usembassy-china.org.cn/aqirecent3.html Now, Chinese consumers vociferously express their discontent with the air quality via Weibo and other social media channels. So Beijing has started paying more attention to the problem. There is a fleet of electric buses in the capitol city, at least. Meanwhile, medium and heavy-duty trucks, while shrinking as a percentage of total vehicle sales, are still a major presence on China’s roads. Many of those trucks are older, highly-polluting models. It doesn’t help that the diesel used in China has a higher sulfur content that that used in Europe and the U.S. Though the central government has long talked about requiring cleaner diesel, it hasn’t acted. That would mean higher fuel prices for users of the fuel, which includes a lot of farmers. They wouldn’t be happy and the central government wants social stability above all else. If the price didn’t rise, however, the companies refining the diesel would have to absorb the cost increase, which would make them unhappy. A no-win situation for the central government. Of course, the central government has also talked a lot about growing the use of new energy vehicles, which includes battery electric and plug-in hybrid electric vehicles, among other technologies. http://europe.chinadaily.com.cn/business/2013-05/31/content_16550740.htm Sales are still slow, however. Hybrids seem to be the technology du jour. Just how committed China is to EVs depends on who in the government you are talking to, said Van Amberg. But, “I still think from an economic development and future technology standpoint, (China) remains highly interested in new energy vehicles,” he said. From a pragmatic standpoint, said Van Amberg, there is a lot of interest in technology that makes diesel, natural gas, and gasoline-powered commercial vehicles more efficient and cleaner. A lot of that opportunity is at the supplier level, he said. In the non-EV area, said Van Amberg, “there is some real interest in China in more advanced diesel technology, in advanced treatment for fuels, in natural gas engine controls, and in fuel system controls. In the EV bus area, however, he thinks China is farther along than the U.S. In the U.S. electric buses are being tested in very small numbers at various cities, said Van Amberg. Even though California has a regulation in place to push zero-emission buses, few are in operation, for example. In China, a side trip after last year’s summit visited a battery swapping site for Beijing’s fleet of 100 electric buses. 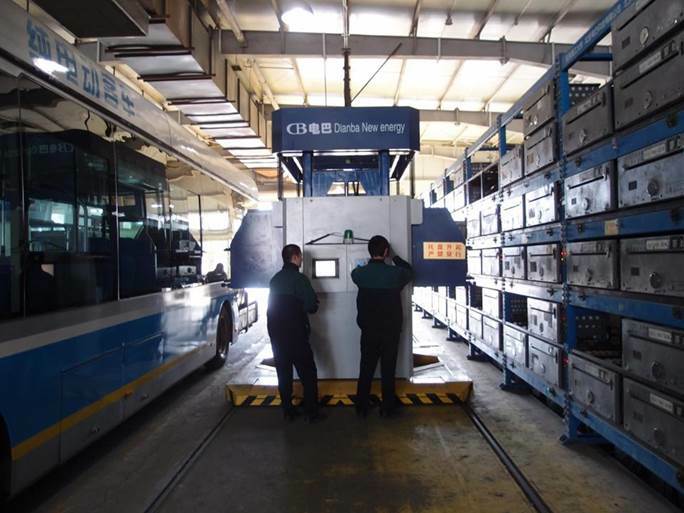 Beijing has a fleet of electric buses that use the battery swapping method. The southwest China municipality of Chongqing has a fleet of fast-charging electric buses. “In China, not only are they fielding the buses, they have been in use for years,” said Van Amberg. “This is a technology that some people in the U.S. would have been very dubious of. In China they just did it.” I pointed out that in China the governments didn’t have to answer to voters or a budget, which makes trying out new technology easier…. Weichai, which produces trucks, engines, and transmissions among other products, was a sponsor, said Van Amberg. No surprise there; on its website Weichai Group bills itself as “green power, drive your dreams.” www.weichaigroup.com Not to be confused with Build Your Dreams automaker BYD www.byd.com , which also sent its marketing manager Sherry Li. Plenty of smaller companies were there as well, however. Micro-EV component maker Shanghai Edrive www.chinaedrive.com was there last year and will return. Nidec Motor www.nidec-motor.com of St. Louis, MO participated last year. Calstart is aiming for 180 to 200 participants this year, said Van Amberg. It doesn’t want to get much bigger because it aims to be a venue in which U.S. companies can get to know potential Chinese partners as well as a venue for information, he said. “The companies we would love to have take part are U.S. suppliers and manufacturers of key components,” said Van Amberg.